1. Hi Adrian, how’s things? Can you tell us a little about yourself and how you started your brands? I think the best way to describe myself is through the brands themselves. I’ve been skating pretty much my whole life and lucky enough to make a career out of it. First and foremost I’m a skateboarder. I’ve always been into old cars, clothing, bikes and the dirty San Diego coastal scene so why not do something different that can embrace it all? When we came up with Loser Machine and Dark Seas I put my life savings up and never looked back. 2. You’re the brand owner of both Dark Seas and Loser Machine Co. Do you see both brands as completely separate entities or do they complement each other? They are definitely two separate brands at this point but they share some of the same influences. The same attitude that Loser Machine brings to the streets translates to Dark Seas for those that spend their time around the ocean. 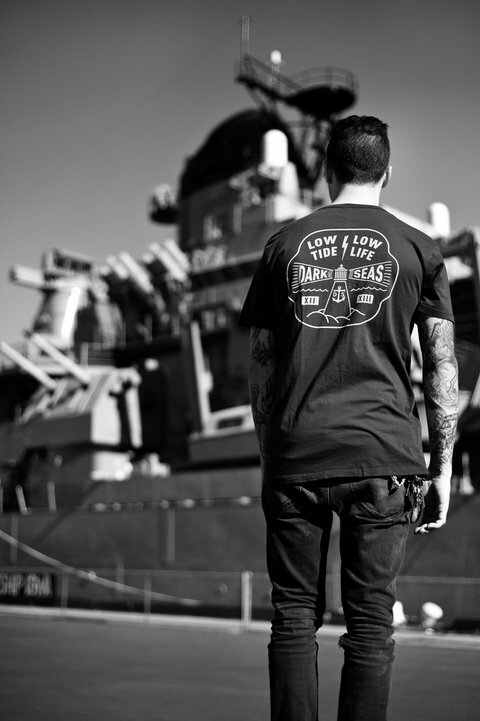 Loser Machine and Dark Seas are brands that celebrate living dangerously. Brands that say “we don’t care what you think and we invite you to do the same”. 3. What are the influences behind Dark Seas? I’m definitely picking up on a maritime theme from the designs I’ve seen. 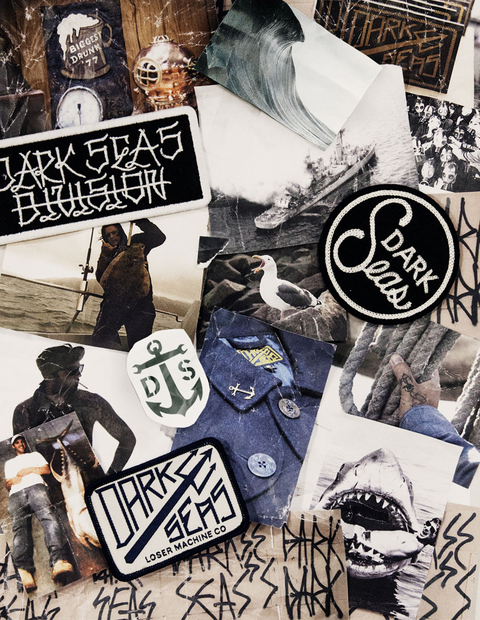 Dark Seas is intended to resonate with anyone that likes the blue collar and maritime aesthetic. For me the beaches weren’t always blues skies and palm trees. As a kid I always gravitated to the mischievous side of life. I remember taking the city bus every weekend to Pacific Beach after long days of skating. We would fish people out to buy us beer and then smoke weed in the life guard towers and watch all the crazy people cruise the board walk. San Diego also has a lot of naval presence on the coast and it’s been a part of me since I was born. 4. As a pro skater turned brand owner, what’s your view on the relationship between streetwear and skateboarding? Do you think it’s a positive thing for the sport or are you wary of some brands’ involvement? Street wear isn’t for me but that doesn’t mean it doesn’t have a place in skateboarding. Skateboarding doesn’t come with many rules so if you want to be a little flashy, each to their own. 5. What are your plans for Dark Seas in the UK? Do you have anything lined up for future releases? We have just launched our first season in the UK with our long time friend, Simon Holmes of Lead Distribution. 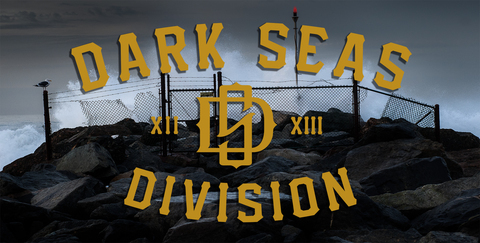 Together we have planned a slow, disciplined distribution that starts at the coastline where Dark Seas belongs. There are a select few accounts that we feel are a strong foundation for the brand and we look forward to growing with them as partners for many years to come. I feel like we are just starting to catch our stride with Dark Seas. It has been really cool to see people identify with it and back what we are up to. In the short term though, keep your eyes locked for the ‘Bad Friday’ nights Dark Seas is presenting in the UK and the Dark Seas Lager and Pale Ale that we have been carefully blending at the Lead Distribution Brewing Facility! 6. Any advice or tips you’d like to share with anyone that’s thinking of starting up their own brand? Part of me wants to say, run for the hills but that wouldn’t be right. I think a lot of people like the creative side of this business and don’t necessarily realize how much more there is to it. To build a successful brand takes some stars aligning, lots of work and I think some luck. Starting your own company isn’t easy and it is definitely not cheap. If you believe in your idea, think it through a million times from every angle and then go for it.